1. How do I buy a gift card? Simply register at GiftCardsWild.com, choose the card that you like, and pay for it through PayPal/INTERAC E-Transfer or with your credit card. After your purchase, shipping will take an average of 3-5 business days. 1.After you log in (at the top right corner), select gift card(s) that you wish to purchase it will be added to you Shopping cart. 2.Press on "Check out now" you will be transferred to Billing address information, please fill it in and press "Save". 3.You will be transferred back to cart, please read and agree to the Terms and Services and press on "INTERAC E-Transfer" or "PayPal". 4.You will be redirected to PayPal page, where you can pay with Visa, Master Card, Amex, or Pay Pal or follow instructions for INTERAC. 2. How do I sell a gift card? 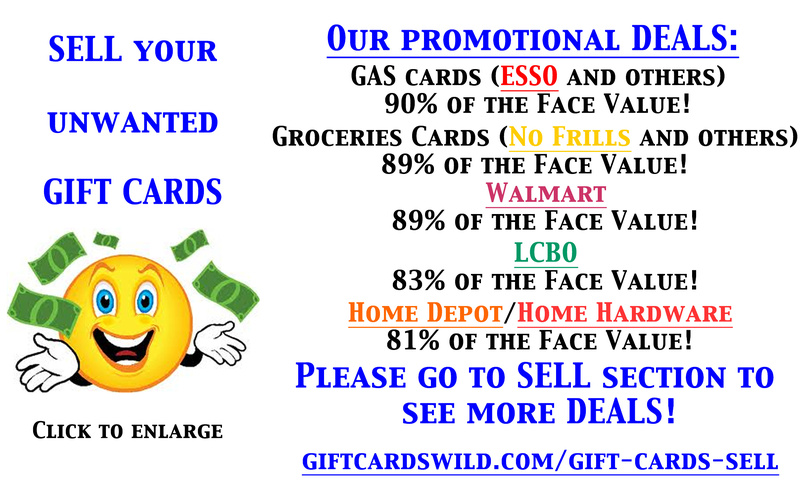 Register at GiftCardsWild.com, enter the gift card’s information, and we will let you know how much we will pay you for the card. Print the pre-paid shipping label and mail your card. Our verification process will take no more than 24 hours after your gift card is received. After verification we will mail you a cheque. 1.From the main page select "Sell"
2.Enter your gift card(s) information, press "Show me $"
5.Fill in address form, "save"
6.Select Terms & Services and "Confirm Order"
7.Print free shipping label and attach it to the envelope. Mail. GiftCardsWild.com is family-operated business. We keep our costs low so you will get better deals on our site. 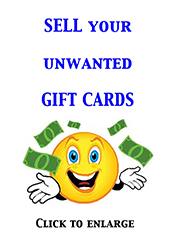 Our goals are to help people save money by purchasing discounted gift cards on our site and to provide cash for people who want to get rid of their unwanted gift cards. 4. Is it safe to deal with GiftCardsWild.com? All gift cards are validated before the buy and sell process. If for any* reason your gift card is not valid once received, GiftCardsWild.com will reimburse you up to $1,000 (lifetime limit). This warranty only applies within 30 days of purchase. GiftCardsWild.com ensures that all personal information of our customers is under the highest security. GiftCardsWild.com accepts credit card and PayPal as methods of payment. Payment options are processed through trusted third party providers and financial information is never processed or stored on our site. 5. Are there any fees? There are no fees and there is always free shipping. 6. Can I return and/or exchange gift card? 7. What if the card I received is not what was described? 8. When will I receive my card? Most Buyers receive their gift card(s) within 3-5 business days of payment within Ontario. Please allow 5 or more business days outside the province. 10. What is a Wish List? The Wish List is a page where you can create your own list of merchants that you are interested in and we currently do not have. By creating this list, GiftCardsWild.com will inform you by email when we have cards available for purchase. 11. What is a shipping label? We guarantee free shipping. When you sell us your gift card, after confirming your order, click on Label, then print and attach the label to the envelope. You can request gift card and pin numbers via email, by writing a comment at the Shopping Cart Screen. Numbers will be emailed within 24 hours after the payment is received. Confirmed – Your Cards have been received and verified. Cheque will be mailed the same day. Please allow 2-14 business days to receive your cheque. Shipped – Your Cards have been mailed to your address on file. Please allow 2-14 business days to receive the cards. Pending – The order wasn't completed on your side. The system will be updated and your order will be cancelled this may take up to 24 hours. 3. Registered name doesn't match Paying information. E-Code - is an electronic code emailed to the email address, physical card will not be mailed. You can use this code to make purchases online. Gift Card - is a plastic card mailed by Canada Post to the address on file. Gift Certificate - is a plastic or paper card or coupon mailed by Canada Post to the address on file. Store Credit / Merchandise Credit - is a plastic card or receipt mailed by Canada Post to the address on file. E-Code/Gift Card - a choice of electronic code or mailed in gift card. Please leave your instructions in comment box before making your payment.